Miami, take Ultra. Indio, go on and have a ball with Coachella, because New York is the only place the Spice Girls will share a stage with Moby, NIN, and t.A.T.u. 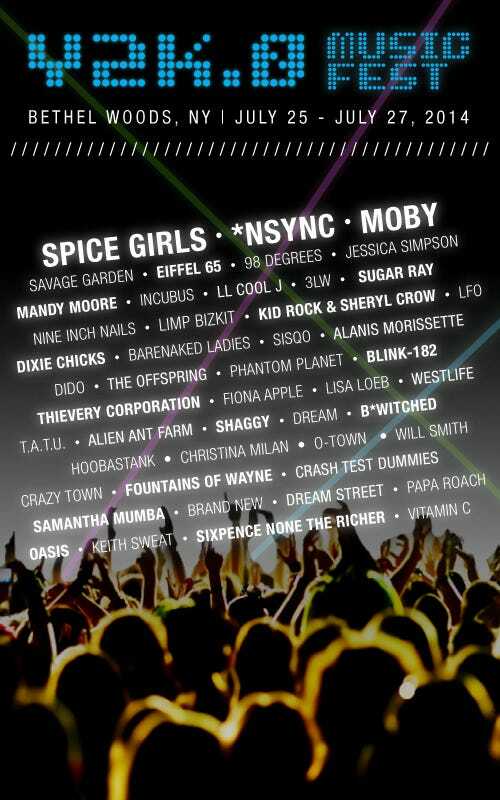 Come the last weekend of July, Bethel Woods, NY, (home of Woodstock) will play host to the first-ever Y2K.0 Music Fest. The name says it all: bands and artists we once freaked out over while the world questioned its survival will reunite for one powerhouse, platform sneakered, and tattoo choker'd event. Seriously, the nostalgia level is off the charts, or, as the kids used to say, all that. The only thing missing between *NSYNC and 98 Degrees, Savage Garden and Sisqó is Britney Spears (but, she's off doing her Las Vegas residency thing). No matter though, there are enough reunions here to make even the most fatigued '90s and early aughts human ecstatic. (Don't expect any Outkast cameos, though; it's too busy romping between all those other other music festivals.) Hey, at least Posh Spice finally came around and decided which little Gucci dress to wear on stage. Y2K.0 will kick off July 25, 2014 and run through the 27th. Tickets are available here.